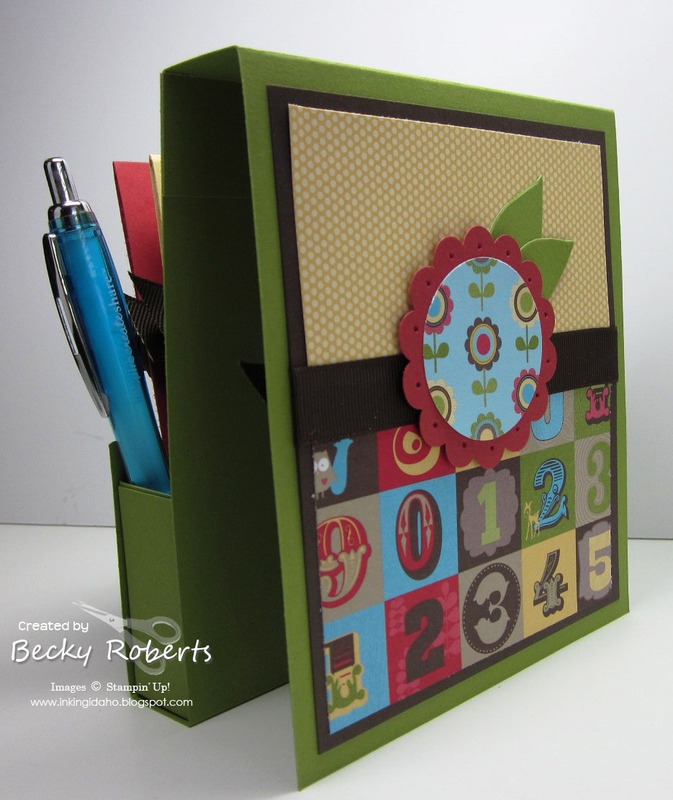 The pattern for this stationary set is in the 12 Days of Christmas 2010 edition found HERE. The photo above shows the outside cover and one of the four cards. I got a little ahead of myself in taking pictures. I forgot to put the postage stamps in the little pocket. Anything can go in the pocket, money, gift cards, a little treat. Side view. 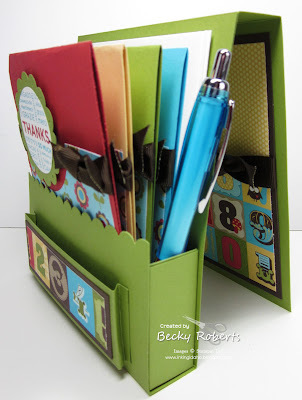 This is with the cover opened and flipped over the back to hold the stationary set up like an easel. Inside the cover decoration which is visible when flipped over. Accessories: Stampin' Write Markers in Riding Hood Red, Old Olive, So Saffron, Tempting Turquoise and Early Espresso, Early Espresso 5/8" Grosgrain Ribbon, 1-3/4" Circle Punch, 2-3/8" Scallop Circle Punch, 2-1/2" Circle Punch, Scallop Edge Punch, leaves from the Table Setting die-cut, and the Big Shot baby! Don't forget about the ABC's of the Perfect Handmade Holiday! 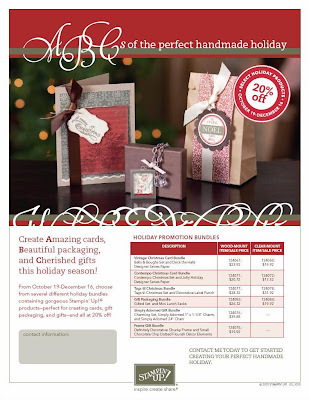 From October 19-December 16, choose from several different holiday bundles containing gorgeous Stampin' Up! products-perfect for creating cards, gift packaging, and gifts-and all at 20% off! Love this. It is adorable. Do you have a template that you are willing to share? It is just tooo cute!!!! Thanks so much for your beautiful work that post everyday! I love visiting your site daily!